Originally posted: March 25, 2019 . Last modified: March 27, 2019 . 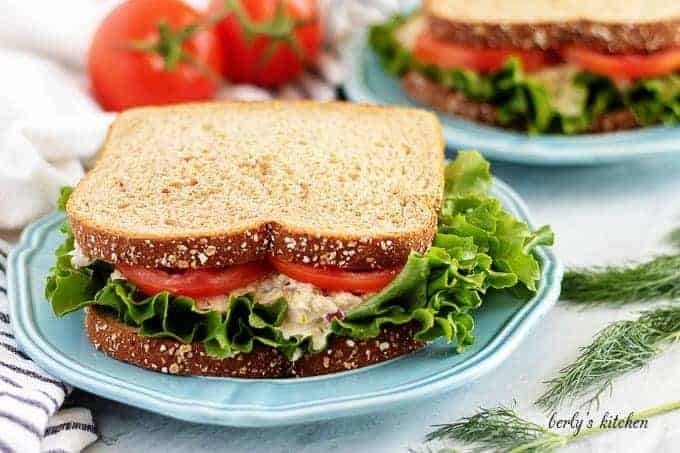 A classic tuna salad sandwich made with red onion and mayonnaise, served on whole bread and garnished with a few goodies to give it that satisfying crunch! A tuna sandwich has to be one of my favorite lunch options. Over the years, I’ve tried a lot of different recipes, but the truth is nothing beats that tuna, mayo, onions, and relish combination. While I do enjoy some of the olive oil and dill varieties, the mayo version just seems to taste better, to me at least. Now, I have learned to dress mine up a bit, and still like adding capers to mix. But, for the purposes of our tuna salad sandwich recipe, I will stick to a more classic version. As is the case with a lot of dishes, simplicity is the key to a delicious meal. And this offering is no different, so let’s get cooking! As you may figured, there’s not much to this tuna salad. A little chopping and mixing and you’re good to go. To start, grab the tuna, red onions, relish or pickles, dill, and mayo. Chop your vegetables and herbs. We used fresh dill but you can use dried if that’s easier. Additionally, I prefer dill relish to sweet relish, but again, that’s up to you. You might be wondering, why so much dill? Well, first of all, I like bitter flavors, like sauerkraut. Moreover, when working with creamy fats, it’s good idea to add something slightly bitter to cut through all that rich, heavy flavor. Moving on, once you have all the ingredients measured out and prepped, grab a bowl and toss everything in to be mixed. 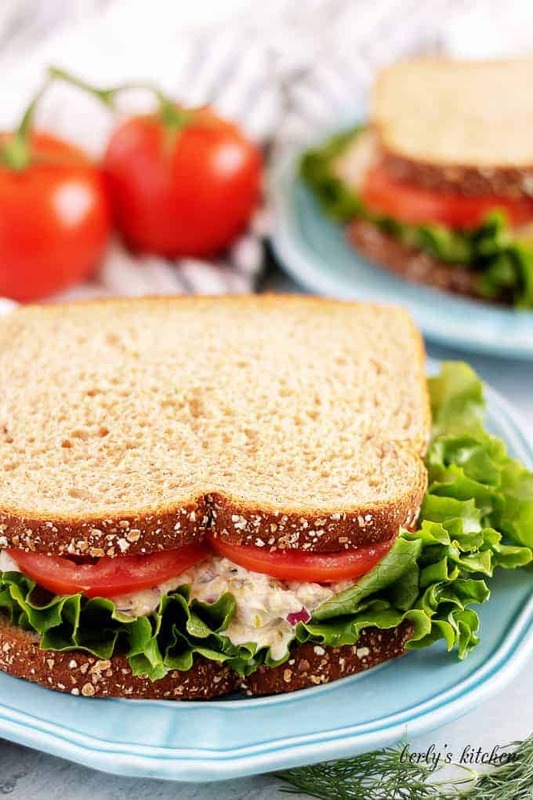 Use a spoon or fork to mix the ingredients for your tuna salad sandwich. That’s it, the recipe is basically done. You can add salt and pepper to taste and serve it on anything you desire. For example, some people enjoy tuna on woven wheat crackers or saltines. On the other hand, we prefer two (2) slices of whole wheat bread, along with crunchy lettuce and sweet tomatoes. In other words, eat it anyway you like, as long as you enjoy it. Kim and I hope like our tuna salad sandwich recipe and wish you all the best! 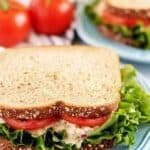 What can I add to tuna salad or What should I put on my tuna sandwich? In short, whatever you want. For example, sometimes, I use mayonnaise, other times, I use Miracle Whip. It just depends on the day. 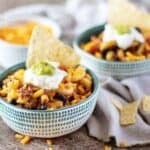 You could also add dried cranberries or raisins, walnuts, or even fresh grapes. The point is, put ingredients into the dish that you know you enjoy. If you’re making this sandwich in advance for lunch or dinner, then I recommend building the sandwich just before you intend on eating it. However, if that’s not an option, then try toasting the bread to keep it from become soggy. 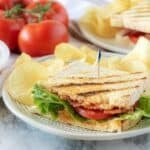 Need more tasty sandwich ideas? 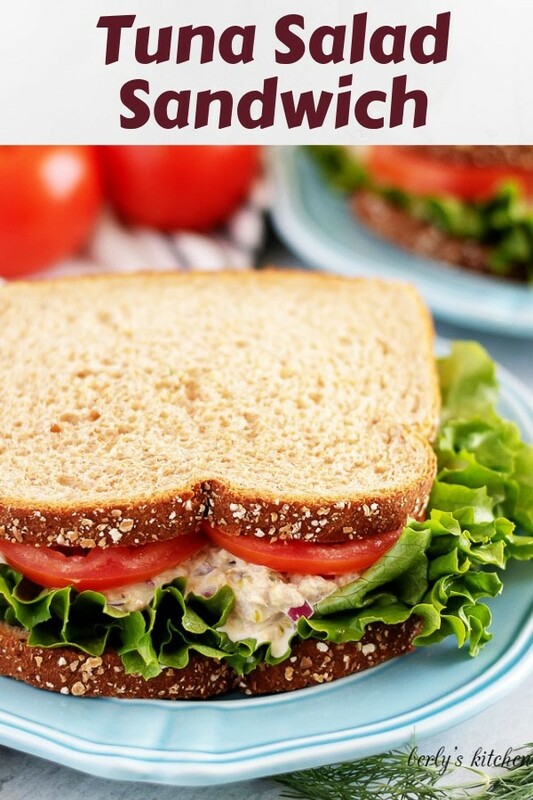 If you enjoyed our tuna salad sandwich recipe, please leave us a comment and rate the recipe card. You can also find us on Facebook, Pinterest, Twitter, and Instagram by searching for Berly’s Kitchen! First, chop and mince herbs and vegetables. 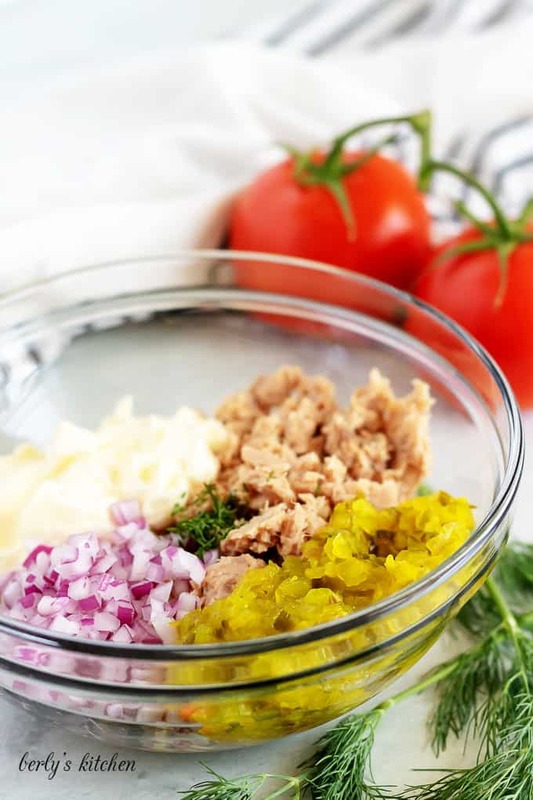 Next, in a large bowl stir together the tuna, red onion, relish, dill, and mayo. Last, split the tuna salad, equally, between the two (2) sandwiches and serve. The calories listed are an approximation based on the ingredients and serving size of one (1) tuna salad sandwich with half (1/2) of the tuna salad on the sandwich. The calorie count does NOT include the lettuce and tomato seen in the photographs. Actual calories will vary. 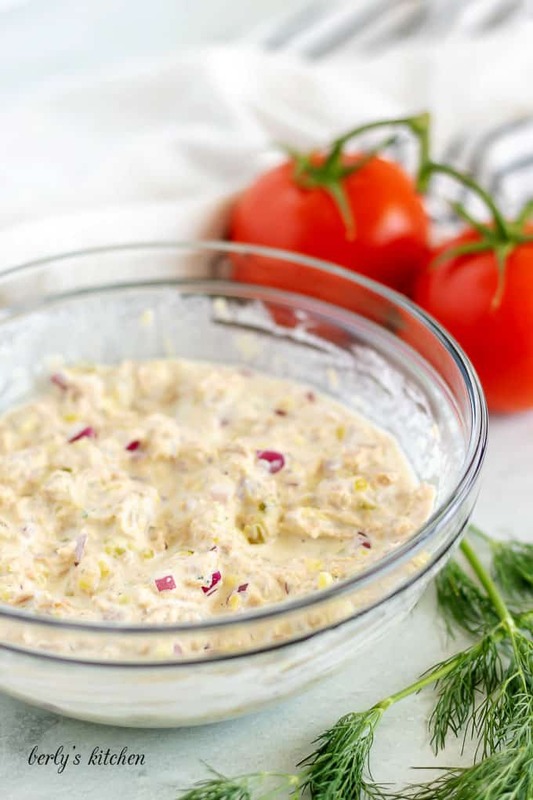 The tuna salad can be stored in your fridge in a sealed container for up to three (3) days.